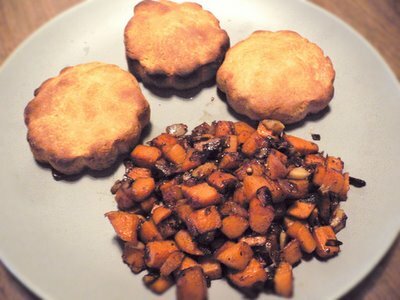 I love Sunday brunches, at home with fresh baked biscuits, sweet potato homefries, fruit salad, frothy coffee, the works. Here are 2 recipes I used from Ayurvedic Cooking for Westerners and A Life of Balance and a picture of the delicious fare, despite the terrible photo...! Stir together dry ingredients in a mixing bowl. Crumble the ghee into the flour with your fingertips, then stir in buttermilk. Knead together, adding more flour if the dough is too sticky. Form into a ball, cover and refrigerate for at least 1/2 hour. Preheat the oven to 400. Lightly oil a cookie sheet and flower-formed cookie cutter. Roll out the dough to 1/2 inch thick, cut out flower-shaped biscuits and place on cookie sheet. Bake for 12 minutes until golden brown. Makes 4. Peel and cube sweet potato into 1/2 inch pieces. Cook in boiling water for 10 minutes, until tender-crisp. Drain. In a skillet, heat oil and ghee and add spices. Stir fry for a minute, then add onion and garlic. Cook for 5 minutes then add sweet potatoes. Continue to stir-cook for 10 minutes over medium-high heat, until potatoes are cooked. Boy, those biscuits are TASTY!! I can recommend them whole-heartedly -- see the ones in the photo? I ATE THOSE! YUM!